KikaEats: Did Your Favorite East Village Restaurant Flunk the Health Department Inspection? 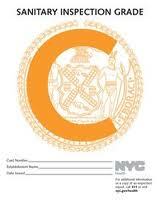 It's been a year since the NYC Health Department introduced its controversial grading policy. A, 0-13 violations; B, 14-27 violations; C, 28+ violations. I'm shocked by how many respectable eateries scored so poorly. And I can't help feeling let down by some of my favorites with their hefty violations. The system has been in place for 12 months now. It's not a new exercise anymore. Come on. Customers deserve better.